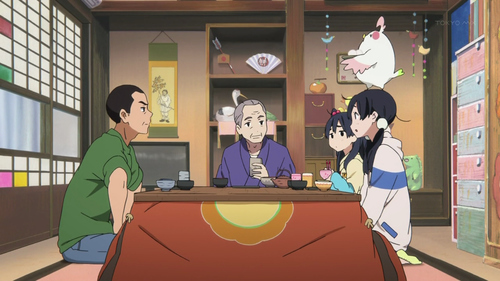 I haven’t blogged an anime series as it’s aired since Bakemonogatari in 2009, but I’m getting back into it again with the delightful Tamako Market. 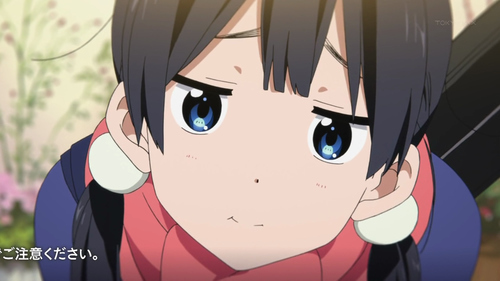 As Clara and I huddled in front of the computer screen to watch Kyoani’s latest endeavour, we couldn’t tell if we were being trolled or not. Or if we were, whether you can be trolled in a good way. The story makes absolutely no sense whatsoever. Firstly, a regal talking bird who’s name happens to be a disparaging review of the foodstuffs his hosts produce? A bird who gains so much weight without simply exploding? The fact people so readily accept the fact he talks after the initial shock subsides? The fact he turns into a projector? For a shameless person like me who watches anime for the art as well as the production studio, the colours, sky and market itself were rather vibrant, more than I was expecting. Clara is an actual artist and seemed impressed by these too, so I knew it wasn’t just me being impressed by something simply because I have no hope replicating anything close to it. The characters. Well, lets just say they look like K-On, talk like K-On, have the K-On eyes and hand gestures. 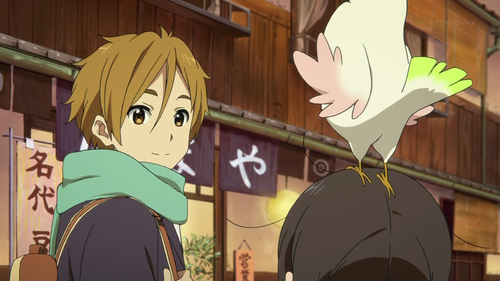 It may as well be K-On, in a market, with a talking bird. I’ll admit, I was excited to see the K-On character design being adopted for… guys. I unashamedly loved K-On, so I’m perfectly okay with this, almost nostalgic. 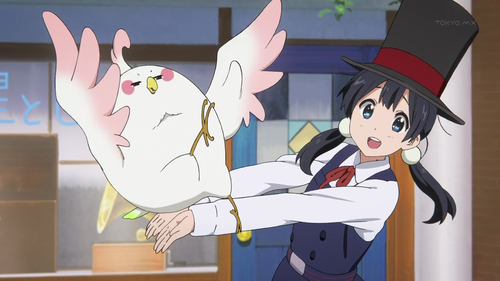 There were a few elements of Hyouka too, especially of Tamako during the ED. Haters gonna hate. I don’t care. I’m going to watch the heck out of this series. The only catch, watching all this food being prepared made Clara and I eat more pizza than we realised, which gave us tummy aches afterwards. This is a concern. Also, for what it’s worth, the florist is already giving me ideas for a cosplay. I couldn’t hope to match our club’s Lexi, but I could try. 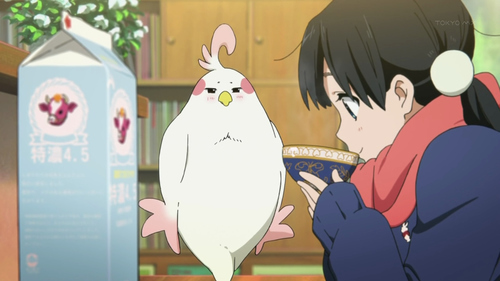 Also, Tamako drinks coffee which is far too awesome for words. Sudohbucks, anyone?